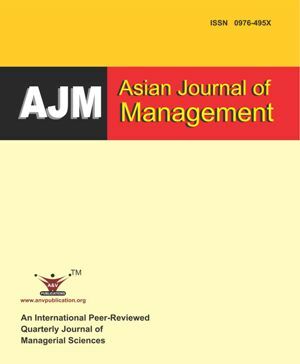 Asian Journal of Management (AJM) (ISSN: print- 0976-495X; online- 2321-5763) is an international, peer-reviewed journal, devoted to managerial sciences. The aim of AJM is to publish the relevant to applied management theory and practice and identify both a compelling practical management issue and a strong theoretical framework for addressing it. AJM publishes Original Research Articles, Short Communications, Review Articles in all areas of managerial sciences. Topics covered are: Strategic Management; Services Management; Health Service Management; Education Management; Operations Management; Organizational Analysis; Financial Management; Organizational Planning; Policy Making and Decision Making; Ethics in Business; Motivation; Globalization; Training and Development; Recruitment and Selection; Industrial Relations; Virtual Technology; Change Management; Business Accounting Initiatives; Partnership Development; Organizational Behavior; Flexibility; Marketing Management; Operational Management; Financial Management; Pharmaceutical Management. The journal is published quarterly every year in last week of March, June, September and December. . . . . Read more. Online since Saturday, Mar 23, 2019 Accessed 878 times. Government’s Policies of Commercializing Rural Education- A New Perspective towards Educating Rural Youths.